Do you want the peace of mind that comes from owning gold you can physically hold in your hand? Gold has survived inflation , deflation, financial crises and natural calamities over the centuries. With today's economic uncertainty, adding gold to your portfolio has become a recognized diversification strategy - serving as a potential hedge against inflation and a declining dollar. 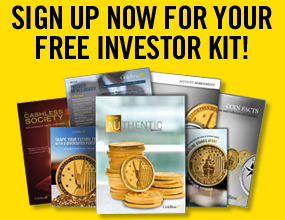 Get your FREE Investor Kit today. 1 This refund policy provides all first-time clients with the right to cancel their first order within seven (7) calendar days from the date of order unless Client's state of residence provides otherwise. Please see our Account Agreement for full details. 2 Under Goldline's PGP, if Goldline's ask (i.e., selling) price for qualifying purchases is reduced by Goldline within 7 calendar days of the date purchased, Client may contact Goldline during the repricing period and request that his or her purchase be repriced at the lower price. Clients may also qualify for an extended 14, 21 and 28 day PGP on qualifying full-priced purchases. Payment and a signed Account Agreement is required before a Client may reprice a purchase. Read our Account Agreement for full details.